The beauty of getting lost at the movies is that it allows us to visit worlds vastly different from our own. It is the greatest exercise in being a fly on the wall. It is the ultimate act of voyeurism. Going to the movies, listening to an album or reading a book are some of the greatest trips we will ever take in our lives. Jason Reitman’s Up In The Air is one of those experiences. Before I go any further, it must be stated that Jason Reitman is his own man. He stepped out of his father’s shadow as soon his first feature, Thank You For Smoking, was released in 2006. He followed that with Juno in 2007 and the rest, as they say, is history. While it helps to be Ivan Reitman’s son in order to have a shot in this business, you have to have talent and hunger to survive in this industry; Jason Reitman has both in spades. He is three for three as far as directing films is concerned. The nepotism claim can be thrown away. He, like Nick Cassavetes, Jake Kasdan, and especially Sofia Coppola have forged their identities in the entertainment business. A famous last name can only get one so far, you have to have the talent and skills to truly survive and endure in the film business. In three films, Jason Reitman has proven that he has the uncanny ability to take other people’s works and transform them into meaningful shadows on the wall. He did wonders with Christopher Buckley’s Thank You For Smoking. He helped make Diablo Cody a household name with her script for Juno. He has taken Walter Kirn’s engrossing novel, Up In The Air, and made it into a poignant film for our times. Walter Kirn is no stranger to film adaptations. His novel Thumbsucker was made into a wonderful 2005 film directed by Mike Mills and starring Lou Taylor Pucci, Tilda Swinton, and Vince Vaughn. Reitman is able to bring Kirn’s vision to life. George Clooney’s Ryan Bingham is the ultimate road warrior. Maybe road warrior is not the right term; sky warrior is more appropriate. Bingham lives his life in the air. He is at his most comfortable when he is in motion. Ryan Bingham’s is a corporate downsizer. He spends most of his life on airplanes and he likes it that way. He works for a company that specializes in firing people. In a time of record unemployment, this is not exactly a job that is going to win you any friends. You would be foolish to brag about this profession at happy hour or a cocktail party. But this is George Clooney we are talking about; he has a suave manner about him that has never stopped since Out Of Sight in 1998. Bingham is an expert in the art of firing people. When he is not doing the work of frightened bosses, he is busy giving inspirational lectures with the standard wisdom of anything one would find in the self-help or business section of their local bookstore. The film focuses on Bingham’s relationship with everyone around him. This is the film’s greatest asset and the film’s hardest point to get across. Bingham’s life seems empty to us because he manages to live a life devoid of any permanent human connections. His constant traveling for his job has made it difficult for him to meet anyone to have a lasting relationship. Judging from the first half of the film, it seems he has the most contact with the prey he is about to fire and his boss back at headquarters in Omaha, Jason Bateman’s Craig Gregory. Yet, observing Ryan Bingham, we understand that he prefers his life this way. This is the ideal existence for him. His apartment looks no different from the anonymous hotel rooms he stays at– hardly lived in. It is the connections he makes in the film that tell the whole story. Ultimately, that is what the film is about– making connections. In his journeys, he meets two very different women who extract very different reactions from him. First there is fellow traveler, Alex Goran, played by Vera Farmiga. She is the female equivalent of Ryan– she lives life with no strings attached. The other is a young college graduate, Natalie Keener, played by Anna Kendrick. It is important to watch how Ryan interacts with both these women. His shell comes undone in different ways by both of them. With Alex, he meets a fellow business traveler. They hit it off as they trade stories about airline points and elite status. One of Ryan’s goals in the film is to reach ten million frequent flyer miles. He is on the cusp of this goal as his empty life is about to be shaken up. Natalie Keener is fresh out of Cornell and has a new way of doing Ryan’s job. Natalie’s grand idea is to fire people via video conferencing. The great irony is that the downsizer gets downsized in his own job. Ryan’s feels rightfully threatened by this new development. His cherished way of life is about to come undone. He decides to take Natalie on one of his cross country trips to show her how his job is done because her way is woefully naïve and heartless. In the process, Natalie will see the cold, harsh reality of her profession. Meanwhile, it is Ryan who finally sees that his cherished way of life is as empty as the hotel rooms he frequents. Jason Reitman has not made a dramedy. I hate that term as much as I hate the term quirky. Yes, I am aware that a majority of the films I like can be labeled “quirky”, but I still hate the term. Up In The Air is an honest film where Reitman deftly balances comedy and drama. There is comedy to be found in the film, but underneath this film’s tale, there are some hard, cold truths that spill out. It does have some humorous moments thanks to performances from Zach Galifianakis (The Hangover) as one of the employees who Ryan has to fire. The always reliable Danny McBride (All The Real Girls and Pineapple Express) plays Ryan’s new brother-in-law. It also should be noted that Jason Reitman manages to get a snakelike performance from Jason Batemen. He is playing a variation of the character he played in Juno. Reitman must have been a fan of Bateman’s character, Derek Taylor, on the television show, Silver Spoons, because Bateman plays both characters as adult versions of Derek Taylor. Ryan’s sister’s wedding is part of the film’s third act. He is a stranger to his family, a fact that becomes painfully obvious when he arrives, but there is love there. The wedding is important because he takes Alex as his date to the affair; their evolving relationship is very important to the film– to Ryan’s view of the world. Alex is a stunning turn from the very talented Vera Farmiga, who holds her own against the charming Clooney. Where was she when they were casting Leatherheads? Farmiga is no stranger to a good role. She was electric in Down To Bone. She played along with the men with great ease in The Departed. She was perfect as Valerie Plame’s stand-in in Rod Lurie’s criminally under seen, Nothing But The Truth. She also has a thing for being the mother or surrogate mother for creepy children in Joshua, The Boy In The Striped Pajamas and Orphan. Thankfully as Alex, we get to see a different side of her. She has great chemistry with George Clooney onscreen. In a year where some films have displayed explosive chemistry between their lead actors, Up In The Air ranks as one of the best. Watch Farmiga very carefully; she is a sneaky siren. Her actions should not surprise us, but they do. That is the result of great storytelling. The other performance to watch in Up In The Air is Anna Kendrick’s Natalie Keener. Kendrick is best known for playing Jessica in the Twilight films, but it is her role as Ginny Ryerson in Rocket Science which caught my attention. Ginny Ryerson was the dynamic high school debate team star. Kendrick was a revelation in the role. Her Natalie feels like an older version of Ginny in this film. It is a pleasure to watch Kendrick interact with Clooney as he teaches her the ropes. In the process of showing her how the job is done, she realizes how heartless her profession is and how far down the moral abyss she has fallen. It is a very different dynamic from the relationship between Stockard Channing and Julia Stiles in The Business Of Strangers which also dealt with the lives of those who travel a lot for business but in a far darker context. In contrast, Ryan starts to see how empty his life has become. In one of the film’s best scenes, the three characters have a very honest conversation about life and expectations versus reality. Kendrick’s role is not a revelation, but the fulfillment of a promise made in Rocket Science. Like her fellow Twilight star, Kristen Stewart, given the right role, she can light the screen on fire. While all of the performances in the film are top notch, each of them revolves around George Clooney’s Ryan Bingham. He is the film’s centerpiece. He also has a very difficult job to do in the film. George Clooney can do a lot of things, but we have always been attracted by his likability. Since Out Of Sight, he has become his own man. He becomes likable over the course of the film as the connections around him humanize him. This is quite an accomplishment for actor of Clooney’s standing. Ryan Bingham seems to be cross between Intolerable Cruelty’s Miles Massey and the title character from Michael Clayton. There are also shades of Aaron Eckhart’s Nick Naylor from Reitman’s first film, Thank You For Smoking. Clooney is able to pull if off because he is a true actor—not just a slick one. He has played three very different characters this year. There is the vulnerable, but melancholy Lyn Cassady of The Men Who Stare At Goats. His Mr. Fox in Wes Anderson’s Fantastic Mr. Fox plays as if Danny Ocean had settled down and raised a family. And now we have Ryan Bingham who is altogether different from these two other characters. It would be tempting to say that Clooney is playing against type and doing it very well. In Up In The Air, Clooney has taken a character who has a despicable job, but seems especially wretched during a prolonged Recession. Toward the end of the film, he elicits our empathy, if not our sympathy. There is a theme that ripples through some of Mr. Clooney’s work this decade. There is a definite anti-corporation vibe that runs through this film as well as Michael Clayton and perhaps Fantastic Mr. Fox. One could argue that there is an anti-establishment theme found in Three Kings, Syriana and The Men Who Stare At Goats. Michael Clayton and Up In The Air both stress the damage that corporate life has done to the middle class. The victims of avaricious pharmaceutical companies in Michael Clayton and the laid off employees in Up In The Air represent the damages done to working families over the last thirty years. I find it interesting that Clooney has chosen to play two characters who address the issues that he feels are important to him. In Syriana and Michael Clayton, his characters confront the problems head on in dramatic final confrontations. In Michael Clayton, he realizes he is part of the problem. 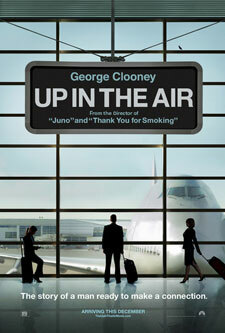 In Up In The Air, he is confronted with the fact his life is emptier then the lives of those he has had to fire. At the end of the day, his life may be more up in the air than anyone else’s. Jason Reitman and George Clooney have truly made an interesting film of our hectic times. In the process, George Clooney keeps surprising us with each character he plays. I promise I will never take him for granted.